Two Bears Farm and the Three Cubs: Who Cut One? 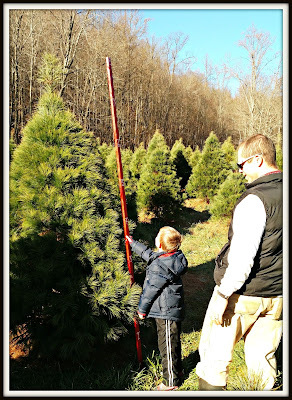 We have a friend that grows white pines to sell for Christmas trees, and we decided to buy our tree from him this year. I took these pictures with my cell phone, so they aren't the best pictures ever. Still, you can see our friend has a great place. The boys had SO much fun playing hide and seek through the rows of pine trees. Here, Reid uses a measuring stick to hunt for the best tree. The other two were busy trying to jump over a creek. Two of our three boys came home with wet pants from dips in the creek. In December. It just seems like with three boys you are always bringing home at least one of them covered in water and mud. 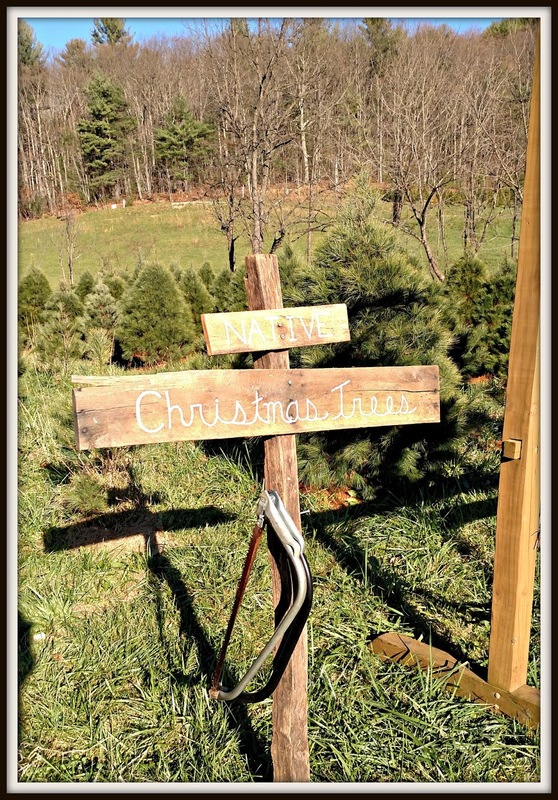 Readers, do you cut your own Christmas tree? Many, many moons ago, until the year we had a bunch of spiders come out of one. Aren't boys fun? I have four grandsons, and they all love to play outdoors. What a lovely time, I enjoyed your outing. I laughed at the title, but also the memories of maybe being the wet kid.i always looked for a challenge. Your sweet boys are certainly enjoying a wonderful life in the countryside Lisa - congratulations on doing everything right, they will have such precious memories of their childhood. We loved seeing truckloads of fresh cut trees being transported through the mountains when we were there last month - the pine fragrance filled the air on those few lovely sunny days. I've never cut my own sadly - and now we have a faux tree for the outside gazebo. Our small cottage sometimes still gets a tiny fresh one, but I mostly just decorate my vintage metal tree tucked in the corner of the dining room - you can see it in my recent post. Enjoy these lovely days (almost too warm here in Raleigh!) leading to Christmas - blessings to you all for a wonderful holiday season. We had real yes when I was a kid. Then they got too expensive. Fake trees ever since. We've never cut our own, but have gotten them from the farms, on-site, where they were cut. That sounds like a fun adventure! 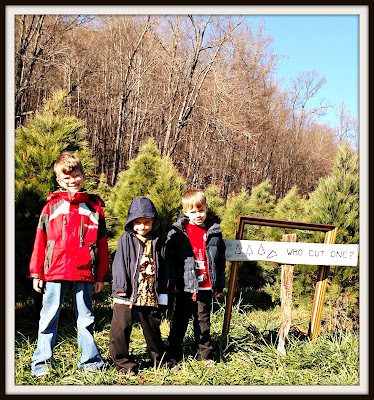 We have a fake tree, but we really want to start the tradition of going to a tree farm to choose a Christmas Tree. Nope. never cut our own. We like to get balsams and they don't grow around here. We do shop at the Lions lot for our tree and the money goes to charity. They are a community organization for men. We have done so a few times. Bought a fancy artificial tree a few years ago to save time. The downside is hauling it up to the attic! I used to buy ready cut Christmas trees from a local shop back when my kids were young, and then it was on to an artificial tree which is still going strong even after years of use. Lovely day out with your boys..... and a day to treasure. 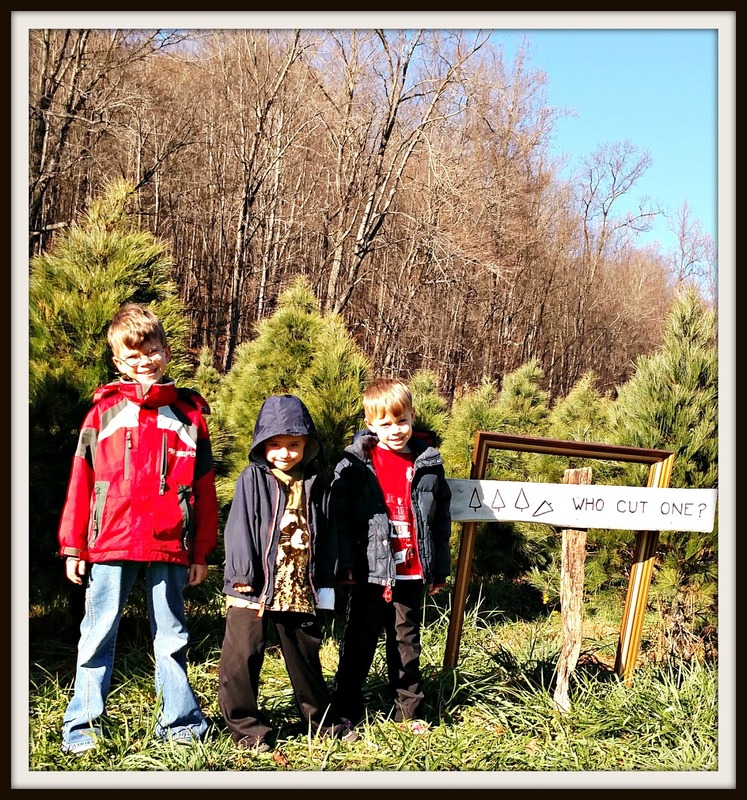 We've never cut our own Christmas tree, but it sure looks fun. Playing hide and go seek sounds like just the perfect thing to do behind those rows and rows of trees! No, with no kids at home anymore we don't have a christmas tree. Besides, the ferrets climb way up to the top of them and then come crashing down in the middle of the night, tree and all. This looks like a wonderful place to get a tree. I used to cut down my own tree and haul it home, but in the past few years I have put up a small fake tree. Maybe next year my fiance and I will cut one down again. :) Looks like you guys made some nice memories (wet pants and all). No we have never cute down our own tree but it sounds perfect! We have done this on our own farm, but it was a few years ago! Beautiful photos... a tree,, feels important- doesn't it? I know the boys had a good time,, and the memories will last forever. I've never cut a tree before. Love these photos of a fun outing. I've never cut my own tree. I remember my parents talking about living on a lot of acres when they first married, and they would search for and cut a fresh tree at Christmas. Hahahaha... Who Cut One is the perfect caption for the first picture.